For a brief description of this subject and a look at the basic Kinetic release of this subject, look here. As we've seen in previous releases, Wingman Models takes selected kits from Kinetic Models and creates 'superkits'. 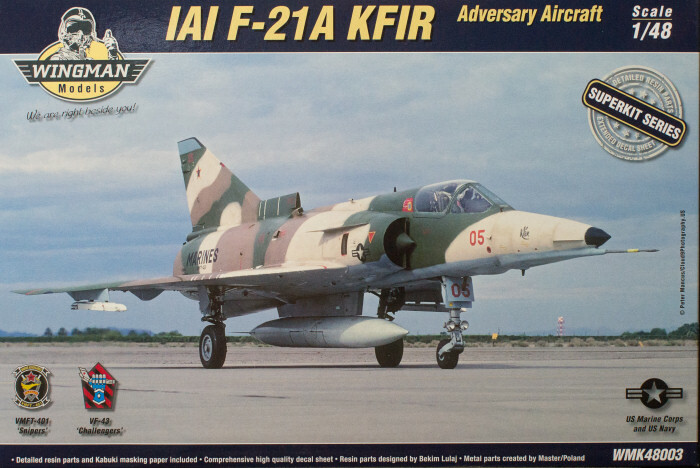 Building upon the Kinetic F-21A/Kfir C1 release, Wingman Models creates the AMS modelers' delight with new resin, photo-etched, and turned brass details plus a nice set of paint masks and decals. Remember that the original Kinetic kit provided the straight leading edges found on the Kfir C1 and the F-21As operated by the US Navy/USMC Adversaries. 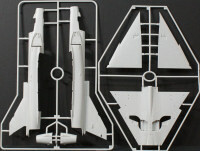 The kit also provides the dog-toothed leading edges found on the Kfir C2s and also on US Adversaries but look closer. Those aircraft have civilian registries (N-numbers) so these are being operated by contractors. The decal sheet renders the bureau numbers and 'bort' numbers as generic numbers that can be mixed and matched to render virtually any F-21 operated by the USN or USMC, not just the subjects of the color and paint profiles indicated above. These decals are nicely done and provide the include a nice suite of airframe stenciling and markings. Painting instructions are provided using FS colors. This is another very nice release from Wingman Models and provides the modeler with the AMS version of the sports version of the Mirage V, the one that replaced the Atar engine with the J79 and started a generation of Kfirs!